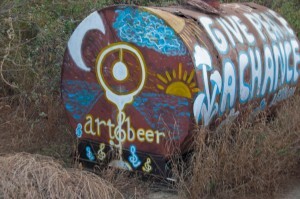 Art and Beer Art & Beer Bar and Restaurant is located near Pescadero, on the way to Todos Santos, Baja California Sur, Mexico. This cluster of palapas is found on the way to Todos Santos, on Mexico 19 at Km 69 on the beach side of the highway, a few miles south of Pescadero. Run by Lourdes Campos and her partner Alfredo Ruiz, the simply named Art & Beer is known for its “chocolate clams”—marinated in 17 ingredients and served raw in their brown shells. They also serve seafood dishes and a vegetarian special. When I asked Alfredo where they were located, he said “somewhere in the desert.” They do not have a phone or internet. Buena Vida This wonderful pizzeria and bar is a great find in the historical district of Todos Santos. Buena Vida Pizzeria is housed in a fine old brick and adobe building with plenty of inherent charm. There is a cozy bar area in the front room of the building and a charming dining area behind it. The ceilings are supported by large beams. Lots of ambiance. An excellent selection of pizzas is offered with an extensive list of additional toppings. The pizzas are thin crust and delicious. Tuesday and Friday in the summer are movie nights with an all you can eat buffet which changes each night for 100 pesos plus drinks. Food is served from 6pm and the movie atarts at 7pm. Very good service and a good full bar. The restaurant is open every night except Thursday from 5pm until 10pm. Visa and Mastercard are accepted. Calle Centenario #40, in the historical district Todos Santos, Baja California Sur, Mexico Cell Phone: 044 (612)-134-3100. Café’ Brown If you are looking for a great little bohemian place to hang out you can find it here at Cafe Brown. An eclectic mix of tables and chairs and art add to the casual stimulating atmosphere. Even the bathroom has a great funky touch. Cafe Brown is the creation of attorney Ikeer Algorri. They often have live music by excellent local musicians and impromtu performances by visiting musical artists. Also African drumming workshops, salsa and salsa workshops and art cinema nights are among the events hosted here. Cooking classes are held by appointment and Cafe Brown offers a catering service. The menu offers a good selection of great fresh breakfasts with coffee and juice included in the reasonable prices. Juices are made fresh and all produce is organically grown locally. The good short lunch and dinner manu offers salads, hamburgers, sandwiches and Mexican specialies including tortilla espanol, chilaquiles, tacos and enchiladas. 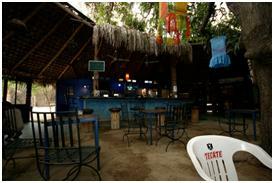 A limited bar provides good drinks such as margaritas, tequila, mojitos, Cuba libres, cervesa and wine. No credit cards are accepted. They are open Wednesday to Sunday from 8am until 8pm. Service is relaxed but good and very friendly. 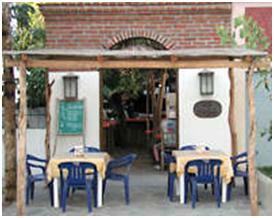 Cafe Brown is located in the Hotel Maria Bonita on the corner of Calle Colegio Militar and Calle Hidalgo. Café D’Licia Cafe D’Licia is an excellent place to stop on your way to or from the beach in the Las Tunas area of Todos Santos. A quaint little tropical paradise owned and operated by Alicia and Don, transplants from New Mexico. 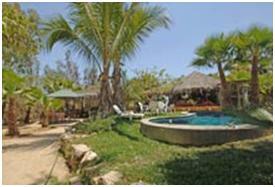 The property is beautifully landscaped with gorgeous tropical plants and home to some beautiful tropical birds as well. 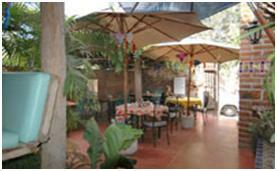 You will dine on a pleasant covered patio surrounded by plants and birds. There is even a small pool for your enjoyment if you so desire. The food is made from freshly prepared home made ingredients and very tasty. The menu is primarily made up of breakfast dishes with some Mexican specialties added. Everything is delicious and fresh. That includes all the plates, fruits, juices and sauces. Camino Guayparin #170, Col. Brisa del Pacifico, Located off the Playitas road, past Super Mercado El Sol II Todos Santos, Baja California Sur, CP 23305 Mexico E-mail: [email protected] Phone: (612) 145-0862. Open Friday to Monday from 8:30 am to 3:00 pm for Breakfast and Lunch. Café Santa Fe Ezio Colombo’s Café Santa Fe is probably the most famous restaurant in town. Opened in the early 1990s in a renovated 1850’s heritage building, the Café Santa Fe has become one of Todos Santos’ landmarks. Ezio’s has his roots in Northern Italy and his food brings the authentic flavors from Italy to Baja without compromise. Ezio is the recipient of the Silver Spoon Award for culinary excellence. 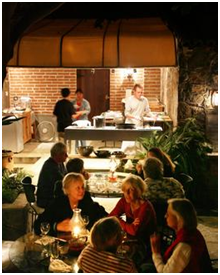 Paula manages the restaurant and assures that everyone is well attended and comfortable. The restaurant grows its own organic produce. 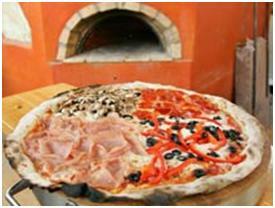 The wood-fired oven is used in many recipes including the delicious focaccia and pizzas. The menu extends to delicious dishes in all areas from appetizers and salads to meats, poultry, seafood, pastas, pizzas, and desserts. Don’t miss this fine dining experience. Cafe Santa Fe is a favorite destination for locals and visitors from around the world. 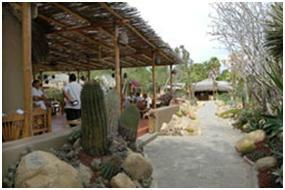 You will be well attended on your visit.Café Santa Fe is open all days except Tuesday from 12 noon until 9pm. Visa and MasterCard are accepted. Address: Calle Centenario, Todos Santos, Baja California Sur. Phone: 612/145-0340. Caffe Todos Santos Caffé Todos Santos, a must see in TS, restaurant was established in 1993 by chef/owner Marcus Edward Spahr. 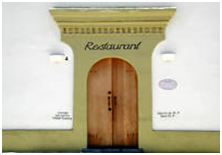 The restaurant has entrances on two parallel streets, Calle Centenario and a courtyard entrance on Calle Miguel Legaspy. The food is all excellent with emphasis on good fresh ingredients. Especially good are the baked goods. The breads, muffins and cookies are among the best and fresh baked on the premises daily. They are also for sale to go. The menu consists of a very comprehensive breakfast selection to big delicious sandwiches, tasty filling soups, excellent salads and a good assortment of Mexican dishes. All are served in generous portions. You often have plenty left to take home. The service in addition to the atmosphere is relaxed but worth any wait that may be incurred. Calle Centenario #33, Todos Santos, Baja California Sur, Mexico. Open Tuesday to Sunday 7:00 am. – 9:00 pm. for breakfast, lunch and dinner. El Gusto! Restaurant at Posada La Poza Resort Gourmet Mexican cuisine with an international fusion is offered at this beautiful European style restaurant. 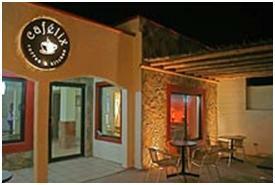 This restaurant definitely raises the bar for culinary excellence in Baja. The restaurant El Gusto! Is very tastefully decorated and comfortably furnished reflecting the taste of its European owners. The walls are graced with art by Libusche Wiesandanger, the owners wife. She is a renowned artist and her works reflect her considerable ability. 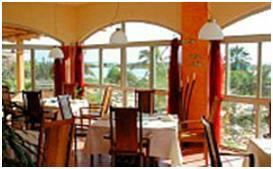 The restaurant uses only fresh local organic produce and freshly caught seafood. The menu changes with the seasons. The chef has done a fantastic job with his creative menu of culinary excellence. Every dish reflects the high standard that has been set by the chef and presentations are as beautiful as the food is delicious. Lunch consists of a delicious selection of soups, salads, seafood dishes and meat dishes. Visa and Mastercard are accepted. The telephone number is 612-145-0400 and the email address is [email protected] The restaurant is open all week except Thursday. Lunch is served from 11:30am until 3:30pm and dinner from 5:30pm until 9pm. El Gusto! 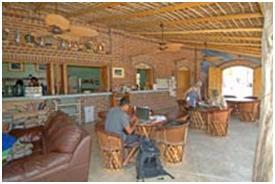 is located at the Posada La Poza Resort in the La Poza district. Fonda El Zaguán A cute charming little sidewalk restaurant on the main tourist street in a fine old brick building. The rustic tables and chairs add to the atmosphere. There is cafe style sidewalk seating in an enclosed nook streetside that is good for people watching and there is very nice interior patio seating as well. The restaurant is very small but nicely done in a simple way. A great little place to enjoy a tasty meal in good company. The food is definitely a cut above the usual streetside Mexican dineries and stands. Fish and shrimp are the restaurant’s specialties and they are well prepared using fresh ingredients and the sauces are very good. Vegetarian dishes are also offered. Calle Juárez between Topete and Hidalgo, next to Ristorante Tre Galline Todos Santos, Baja California Sur, Mexico Phone: (612) 131-6769. Il Giardino Pizzeria Il Giardino Pizzeria is an excellent family owned restaurant offering the best of Italian cuisine at less. Enjoy the outdoor patio seating with palapa and palo de arco shade surrounded by a beautifully landscaped desert garden. The excellent menu is composed of light appetizers, salads, pizzas, and pastas. Pizzas are the most popular choice, which are made thin crust in a wood-burning stove. Choose your own ingredients from a variety of fresh vegetables, fine meats and cheeses or try one on the menu such as the Margarita, Vegetarian, or 4 Stagioni. The bread is made fresh and served before your meal with oil and vinegar. Calle Degollado entre (between) Raul Carrillo and Olachea, Todos Santos, Baja California Sur, Mexico Phone: (612) 145-0199. La Cornonela Bar and Restaurant at Hotel California The Hotel California is the home of La Coronela Restaurant and Bar. The owners and designers of the hotal have done an excellent job redecorating the old hotel bar and restaurant. The old historical charm has been presereved and improved with some cool new touches. Attractive lighting also adds to the overall level of attractive charming atmosphere. Everything is well decorated and comfortable. The kitchen is excellent. Very good to excellent solid creative dishes using the best of fresh ingredients are international in origin with Mexican touches to set them off. Breakfast is a good mix of international dishes and Mexican plates. The restaurnat offers a well planned versatile lunch and dinner menu from soups and salads to appetizers, pizzas, sandwiches, pastas, house specialties and daily specials. Don’t miss the desserts they are great! Visa and Mastercard are accepted. The telephone number is 612-145-0525 and the email address is [email protected] The restaurtant and bar are open daily from 7am until 11pm. 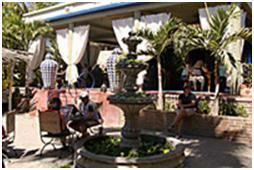 Hotel California is located in the center of town on Calle Juarez. La Esquina La Esquina offers healthy food choices in a friendly and relaxing environment. Free wireless internet is available to all customers. Palapa with garden patio and lounge area. Healthy sandwiches, organic salads, tasty soups, and delicious smoothies. Homemade bread and baked goods. Very good fresh food at very reasonable prices are the key to this restaurant. A large open patio with a relaxed atmosphere defines the dining area. The patio is covered by a thatched awning and a palo de arco shade cover. Also offered to drink are teas, juices (a large selection), smoothies, tequila, cervesa and a limited wine list. Happy hour is from 5pm to 6pm every day. Closed on Sunday. Calle Topete and Horizonte (across from Casa de Drácula) Todos Santos, Baja California Sur, CP 23300 Mexico Phone: (612) 145-0851. 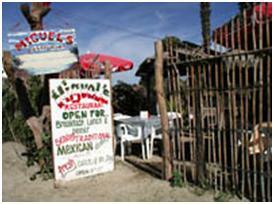 Los Adobes So typical of Todos Santos, this charming eatery featuring continental food with a Baja twist is an oasis unto itself. Once an old adobe ruin and a sugar cane warehouse, it now is one of the best places to dine for Mexican cuisine in Todos Santos. A Day-of-the-Dead figure welcomes guests into the large palapa wood-beamed patio. While perusing the extensive menu, birds flitter in and about the desert garden that houses islands of native plants and rocks. Comfortable rustic furniture of wood and cane suggest staying a while to observe the peaceful surroundings. Whether for lunch or dinner, you can be assured of dining well. Soups such as Mexico’s namesake Sopa Azteca, or the Sopa Tarasca, a creamy blend of Mexican beans and chipotle chilies, topped with tortilla strips and panela cheese, or the gazpacho Tajin, the real Spanish variety, could be sufficient to stop and not go any further. Vegetarian dishes are offered. Calle Hidalgo between Juárez and Militar. Open Monday – Saturday 8:30 a.m. – 9 p.m. Sundays 8:30 a.m. – 5 p.m. Visa and MasterCard accepted. Reservations suggested (612) 145-0203. Michael’s at the Gallery Recently opened in December 2008, Michael’s at the Gallery is one of the few Asian themed menus in town. The chicken lamb and panko fish keep the locals coming back for more (the curry dipping sause is a stand out). Bring a sweater during the winter – it’s cold sitting on their patio; however, it’s well worth it as Michael Cope continues to charm and entertain with his great sense of humor and cooking at night and exquisite gallery in the day. Make a reservation. They’re only open three nights a week, Thursday thru Saturday, 5-9:00 pm. Phone 612-145-0500. Miguel’s Restaurant A very good Mexican menu is offered at Miguel’s Restaurant with all the traditional classics being covered. The specialty of the house are the Chiles Rellenos and are very good indeed. Of course plenty of cold cervesa, margaritas and more are served up by the bar. A good spot for locals, visitors and surfers alike. A good mix of people frequent this restaurant. Service is good and friendly. No credit cards are accepted. The hours are from 8am until 9pm for breakfast, lunch and dinner. 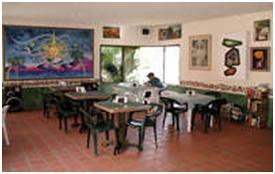 Miguel’s Restaurant is located on the corner of Avenida Santo Degollado and Calle Rangel kitty corner from the Pemex station. Open 8 am to 9 pm for breakfast, lunch & dinner. 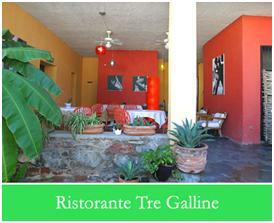 Ristorante Tre Galline An authentic touch of northern Italy in southern Baja. The owners Magda Valpiani and Angelo Dal Bon are from the Salo district near Lago Di Garda. They import many of their ingredients and wines from their native Italy to enhance the traditional Italian flavors served out of their kitchen. Magda watches over the kitchen to assure the quality of the food and Angelo attends to the customers comfort and enjoyment of the dining experience. The menu is extensive and includes an excellent selection of authentic dishes in all categories including appetizers; soups; salads; fish, poultry, and meat entrees; vegetarian plates and desserts. Pastas and made fresh on the premises and offered in an excellent variety. Service is attentive. Calle Juarez and Calle Topete, Todos Santos, Baja California Sur, Mexico Monday through Saturday from 12 noon until 10pm Phone: (612) 145-0274; Cell: 044 (612) 119-9718. Sandbar The Sandbar is a casual and fun restaurant, bar an grill where you can kick back and relax with friends or enjoy an exiting evening of music and entertainment. The unique setting is what makes this place special and unforgettable. Centered around an enormous mango tree, this sand- floor, palapa-style hang out offers fun for the whole family. There are a variety of activities to choose from including pool, fooseball, and rock climbing. The kitchens motto is “grill your own, chef gone surfin”. The grill your own menu includes chicken sandwich, New York steak, Filet Mignon, cheeseburger and Ahi Tuna. From the kitchen you may order the delicious homemade chili, salad, chicken wings, chilidogs, or French fries. Have a drink from the fully stocked bar, serving ice-cold beer, tropical drinks, and liquor. During the mango season be sure to order a mango margarita freshly made from the restaurants mango tree. Highway 19, Km. 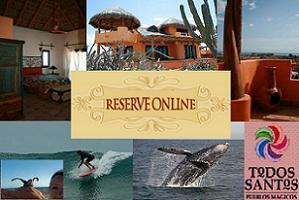 63, Pescadero, Baja California Sur, Mexico Phone: (612) 130-3209. Tacos Chilakos A very nice little taco stand well located in the center of town on the principal tourist street. 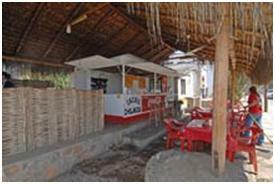 The seating and tables at Tacos Chilako’s are plastic situated under a thatched awning. Very simple but with good food. They serve tacos, burritos, tortas (sandwiches) and potatoes with good sauces. This is a very popular taco stand frequented by many locals and visitors alike. The stand is open Monday through Saturday from 9am until 9pm. No credit cards are accepted. Service is quick. Tacos Chilako’s is located on Calle Juarez near the corner of Calle Hidalgo.